We all do it. It is part of living with others, but how much is enough and how much is just too much? We all want to interact with people who don’t smell, keep their hair clean and don’t have food fragments stuck in their teeth. Working with others seems to call for a minimum level of grooming and in fact may even be tied to our ability to keep our jobs or progress up the corporate ladder. 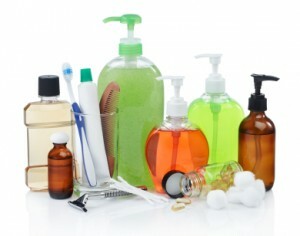 Just this level of grooming for a woman generally requires: makeup, makeup remover, deodorant, hair removal cream (for the legs and underarms), skin creams to lubricate and soften, shampoo and conditioner, mouth rinses and tooth cleaning products, curling irons and hair dryers, manicures/pedicures or the supplies to do them yourself, soap of course, and etc. Men use shavers, razors, hair cremes, hair removal (for the face, back, nose, etc) as well as the soaps, deodorants, shampoos and conditioners, mouth rinses and tooth cleaning products. According to a Nielson study, most of us just get these products from the local grocery or discount store, but even so, their cost adds up. Sometimes, your employer even requires a certain level or type of dress, hairstyle, and general grooming effort. Mine had a dress code. Business casual clothing was what it called for – meaning khaki pants and a collared shirt for the guys and the same for the girls unless they choose to wear a dress or skirt/blouse. Certain types of shoes were also forbidden (such as flip flops or tennis shoes). Others have to wear a certain uniform or certain color and quality of suit or dress. Beyond that, what is important? During my career, I felt it was important for me as a manager and representative of the company to clients to present an acceptable appearance. I also felt it was advisable to appear somewhat younger than my real age (I was always generally 15 – 20 years older than my co-workers) – for credibility mainly. As a result, I dyed my hair and keep it trimmed up – a monthly procedure costing around $70 per visit. I also thought it wise to whiten my teeth once a year – using the over the counter whitening strips – at a cost of $45 – $35 dollars a year. When I was a teen, I poured over books and magazines that purported to know how I should look and what I should do to get that look. This pressure still exists. A site, Elegant Woman, has some pretty specific instructions on what you need to do! Four years ago, Yahoo Answers had a question posed: Whats your personal grooming routine and how much does it cost you each month? Some of the responses are pretty interesting. One person used a certain skin cream to keep their tattoo colors bright and vibrant! Should you spend more on grooming as you age? As we age, our bodies show the wear and tear. How do you make the decision as to how much repair and maintenance to do? Shouldn’t it be just the opposite. When we are young, our skin is usually even toned and firm. Our hair is full and glossy and our bodies slender and weight distributed proportionately. As we age, our epidermal collapses with less collagen, our middles expand, our hair gets dry and brittle and our faces and necks sag and hang. Still, repair is expensive and not typically covered by insurance. Eyelid lifts, liposuction, facelifts, breast reductions and skin repair treatments to remove age spots or busted veins and etc are some of the solutions available, but even they are temporary. There is even a non invasive procedure to burn your bellyfat off – you need at least 4 treatments, one for each quadrant of your middle section – at around $2K per treatment. You can’t even write it off on your taxes either! Perhaps we just no longer have to care as we age. We aren’t usually trying to attract a mate. Often we no longer depend on fitting in to ensure our livelihood and lets face it, the procedures available just aren’t all that great. Although I don’t track my spending on grooming apart from my weekly Walmart shopping (except for the hair and tooth thing), I suspect that at least 10% of our weekly bill is spent on personal grooming, and that doesn’t even include items for health (such as vitamins or insect repellent). Of course since we are retired, our spending on clothing items is now way down and some of that would normally also count as personal grooming, along with the costs of maintaining those items in acceptable wearing condition. How about you? What do you spend on personal grooming? I spend on good face creams and have $2 haircuts in my village so that’s about it! Sometimes I dye my hair at home and all the other basics I do myself. It is really expensive to get a manicure or pedicure that you can do yourself just as well with a bit of practice. I could cut a lot of cost out by doing my own hair again (I did it for years) and going to a cheaper place for cuts. It’s one of my splurges! Personal grooming gets more expensive as we get older, but we can really save some money if we do some of these things ourselves instead of paying a professional to do them. Very true. I personally have never had either a manicure or a pedicure. I can’t imagine letting someone else work on my feet! I hate to tell you, but the only thing wrinkle cream did for me was to soften up my wrinkles! A few years ago, all my hair fell out due to a hospital procedure. My wife thought it was a good look, so I now shave my own hair down to nothing once a week. I shave my beard every day. Having no hair at all makes grooming kind of easy. Hope that procedure was effective & beneficial! My son shaves his too – but he does it because he is getting bald here and there and wants a consistent look. That is a really good question. This is the area where we can all spend less money, but something you can just not do it by yourself. Like I tried to do highlights on my hair at home and it turned out to be a disaster and took sooo long! Instead, I decided to get my highlights done at a hair salon every 4 months versus every 3 months. This way I save a little money and don’t look hideous! Stretching things out… a good tip. Thanks. LOL! This is one of my hobbyhorses — good post! Incredibly, as I’m pushing 70 my hair has yet to turn grey. But…I’d already decided that there’s NO way I’m going to dye it, anyway. Or bleach it. The last time it was subjected to permanent lotion was when my mother insisted that I just HAD to have a perm (she was annoyed because my roommate, whom she disliked, had taught me how to set my hair on rollers). It wrecked my hair and I’ve never allowed that again. Most older women’s hair is fried from chemicals…mine still looks like it did when I was 25, only curlier. Otherwise: Olay makes a very fine antioxidant cream; contains the same ingredients as the wildly overpriced stuff and is available at Costco, drugstores, Target, and probably Walmart. Pantene makes a superb shampoo and conditioner. Any unscented body cream will sooth the itch and wrinkles of old age, but if you want to splurge, get the shea butter cream from L’Occitane. You can find similar products at Sprouts for less money but in much smaller containers, alas. Older faces have more character than young smooth ones! To get my hair done (I have quite long hair). A nice cut and dye it would cost me $150 to $175. I was picky so only went to nice salons. I would not risk going to a cheep $15 hair cut place. It was too much for my current budget (I’m a full time student now). So I decided to do it myself…..I watched some You Tube videos. I am pretty good with hair. I cut my husband’s when he needs it and stuff. However female hair cuts are a lot different than a guy’s cut so I was a bit nervous. In the end it turned out great. And it only cost me $30 for the dye. So now my hair cuts and dye trip I do myself and it only costs me $30. I need to find a different dye though because it made my hair a bit coarse. But over-all I was happy it turned out nice and I saved a lot of money. I used to cut my spouse’s hair and my two sons as well. However, I was never much good at it! I have an ex-girlfriend who cuts my hair every couple of months which saves me a lot of cash each year. I also have been using the same razor for almost five years now and it still gives me close shave! Be sure and change out that razor if it is a disposable – nasty germs in those things. If it isn’t, disinfect it. Our skin carries a remarkable variety of germs. Thank you and good to know. The razor is not a disposable one and I do run the blades under very hot water each time before I shave.